Cape Girardeau’s first baby of 2015, Brantley Ryan, at Saint Francis Medical Center. 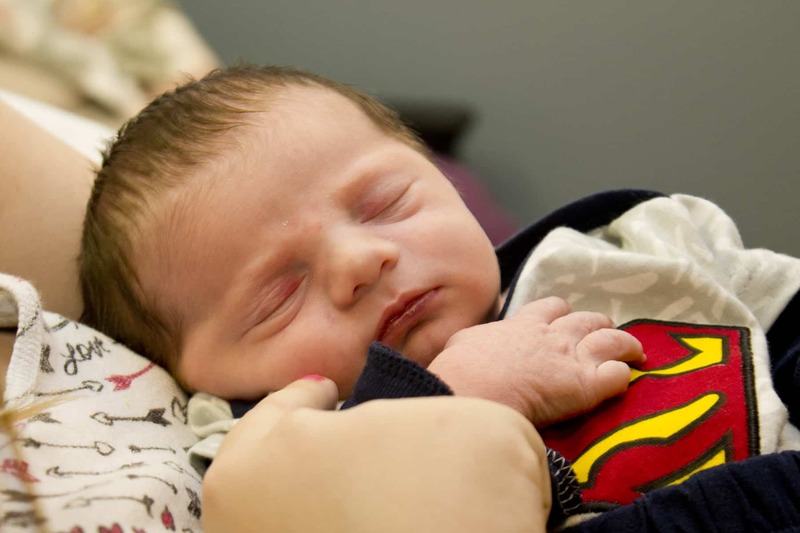 Saint Francis Medical Center celebrated the delivery of Cape Girardeau’s first baby of 2015. At 3:54 am on Thursday, January 1, 2015, a baby boy was welcomed into the world by proud mother Carolyn Shane of Marble Hill, Mo., and caring Family BirthPlace nursing staff. Kimberly K. Roos, MD, FACOG, obstetrician/gynecologist at Cape Care for Women, delivered 7-pound, 7-ounce, 20-inch Brantley Ryan. To further welcome the new arrival, the Medical Center presented the family with a special basket of baby items. The Family BirthPlace saw many unique names throughout 2014, but some names appeared more often than others. For girls born at Saint Francis in 2014, the most popular name was Isabella; and for boys, Jaxon. These names were followed closely by Lily, Averie, Ellie and Olivia for girls, and Easton, Mason, Liam and William for boys. Unique names on the list for 2014 were Liberty, Lennon, Poppy and Southerlynn for girls and Gehrig, Hawken, Porter and Zeek for boys. Consistent with national trends, many babies born in 2014 were named after celebrities and popular television show characters, namely, Piper (“Orange is the New Black”), Scarlett (“Nashville”) and Avery (“Gray’s Anatomy” and “Nashville”) for girls and Gunner (“Nashville”) and Garrett (“House of Cards”) for boys. Country music stars influenced several names too, including Blake (like Shelton), Brantley (like Gilbert), Easton, Corbin and Luke (like Bryan) for boys. Old-fashioned names are also making a comeback, with Caroline, Charlotte, Elsie, Gladys, Mary-Lou, Patricia, Ruby and Vivian all on the list for girls in 2014, and August, Charles, Donald, Dwight, Everett, Hank and Ronald on the boys’ list. Destination names were also popular in 2014, especially for girls, with names like Arizona, Brooklyn, Carolina, Egypt, Londyn, Memphys, Montana, Savannah and Vegas. For boys, motors and cars seemed to be a trend, with names like Bentley, Chevy, Diesel, Gauge and Kruise appearing on the list. The Family BirthPlace ended the year with 910 deliveries, including 18 sets of twins – seven in January alone!